Yazu Ryoichi independently conducted research on calculating machines, and after obtaining a patent, manufactured Japan's first mechanical desktop calculating machine in 1903. It is said that Yazu got the idea for the calculating machine while helping with his father's clerical work. After dropping out of junior high school, he learned the basic subjects at a private school, and did research on flight and desktop calculators. With a model of his biquinary mechanical calculating machine (automatic abacus), which took three years of hard work to complete, and a paper on "Principles of Flight", which summarized the results of his years of research, he met with a man named Takahashi, who was the editor in chief of the Fukuoka Nichinichi Shimbun newspaper. Takahashi was greatly impressed by Yazu's abilities, and wrote a letter of introduction to Mori Rintaro (Mori Ogai), who was a medical officer in the Ogura 12th Medical Corps. Ogai also was deeply impressed by Yazu's character and research, and worked as a go-between with the professors of Tokyo Imperial University. In March 1902, Yazu applied for a patent on his automatic abacus, and completed a version made entirely of metal. The patent was granted in January 1903, and in March a shop was established, and the first calculator in Japan was manufactured. 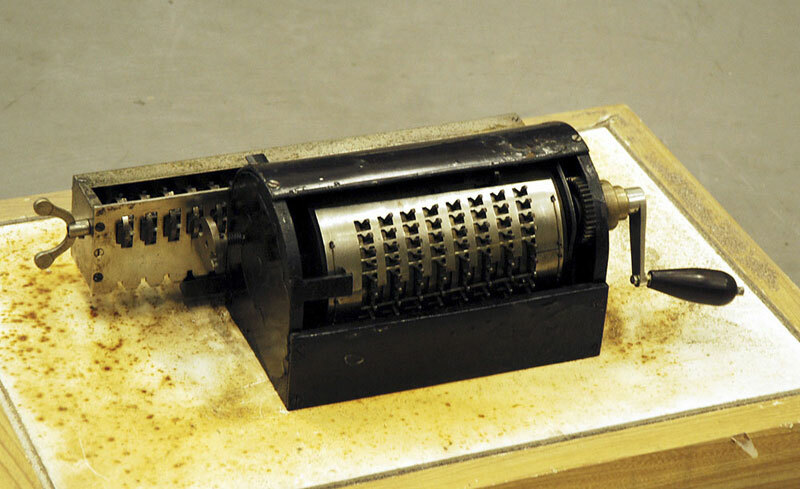 This was a manual desktop calculator which perfofmed decimal arithmetisc operations using a single cylinder and 22 gears with biquinary number setting. The price was high -- ¥250 for one machine -- but more than 200 were sold. The profits from the sale were invested into Yazu's airplane research. Yazu Ryoichi died young, at the age of 31. The following description is from the pamphlet for Yazu's automatic abacus. "Today, calculators are everywhere in the cities of Europe and America... However, these calculators were invented by foreigners with no knowledge of our abacus, and although they are superior to the abacus in many ways, there are more than a few points where they are still inconvenient. This new automatic abacus can meet the needs of those who wish to combine the abacus and the calculator to realize a fast calculation machine, and is being purchased by many customers who previously used foreign-made calculators..."
One of Yazu's calculators was preserved by the Hisatomi Family of Buzen Sho-e (the descendants of Yazu Ryoichi's elder sister), but today this machine has been entrusted to the City of Kitakyushu, together with its related documents.